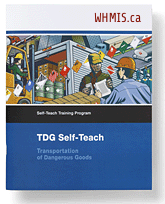 Our continually updated, current TDG course meets all of Transport Canada’s training requirements under the TDG Regulations, for all persons involved in the Transportation of Dangerous Goods by ground. Our course is ideal for shippers, receivers and drivers. Written in simple language, the exercises, examples and practical workplace exercises in the TDG Self-Teach® training manual will engage the adult learner and make for an interesting and educational learning experience. Our courses focus on elements that ensure the information is understood, retained and easily resourced. Each package includes training materials for one person: a Self-Teach manual, a final exam that the employer marks, a class guide, placarding guide and practical workplace exercises for site specific training and a certificate. TDG certification is valid for 3 years upon completion and is non-transferable. This training is meant to used as independent study and allows students to go at their own place. It works well in small or large groups and provides room for discussion and site specific training. This award winning program is used by Canada’s largest and most recognized companies. Quantity discounts apply to purchases made in bulk.